Listeria monocytogenes is a foodborne human pathogen capable of causing life-threatening disease in susceptible populations. 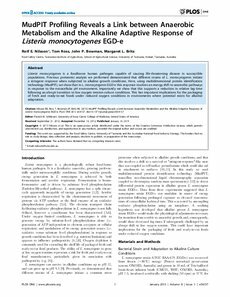 Previous proteomic analysis we performed demonstrated that different strains of L. monocytogenes initiate a stringent response when subjected to alkaline growth conditions. Here, using multidimensional protein identification technology (MudPIT), we show that in L. monocytogenes EGD-e this response involves an energy shift to anaerobic pathways in response to the extracellular pH environment. Importantly we show that this supports a reduction in relative lag time following an abrupt transition to low oxygen tension culture conditions. This has important implications for the packaging of fresh and ready-to-eat foods under reduced oxygen conditions in environments where potential exists for alkaline adaptation.